UPDATE: There was an error in the original table regarding Eugene’s relative rankings. It has since been corrected. The BEA released GDP by Metro Area today for 2010 along with revisions to 2007-09. 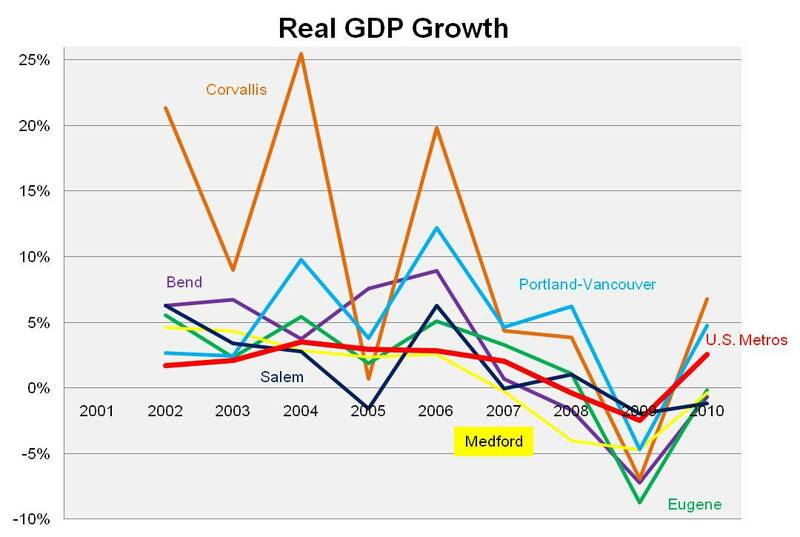 Both the Portland-Vancouver MSA and Corvallis MSA outperformed the U.S. Metro average in 2010, however the other Oregon MSAs (Bend, Eugene, Medford and Salem) did not. Over the past decade, all Oregon MSAs, except Medford, outperformed the national average. The following table shows each Oregon MSA’s relative ranking compared to all of the nation’s MSAs. Note that the percentile is calculated such that the value represents the percentage of MSAs in the country that had lower growth. E.g. Corvallis’s growth in 2002 is in the 99.5th percentile, which means that 99.5 percent of all MSAs in the country had slower growth than Corvallis did. Conversely, Salem’s 2010 growth ranked in the 5.5th percentile, meaning only 5.5 percent of all MSAs around the country had slower growth.